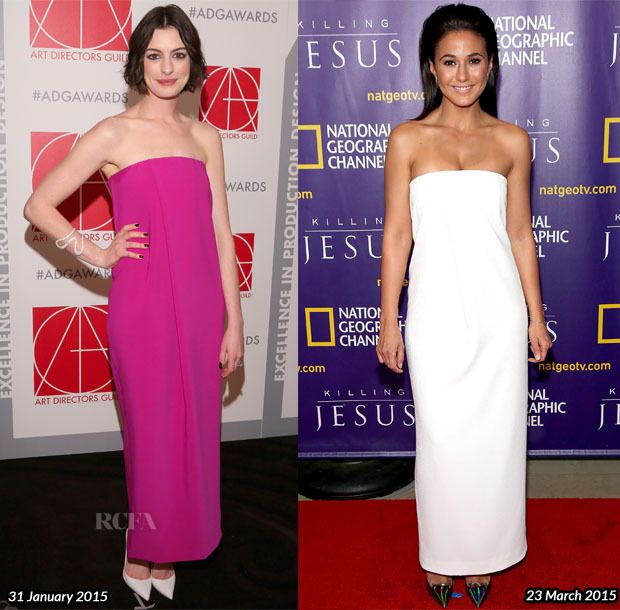 Who Wore It Better… Anne Hathaway or Emmanuelle Chriqui? Anne Hathaway wore a Solace London eye-catching raspberry-hued dress to the 19th annual Art Directors Guild Excellence In Production Design Awards back in January, pairing the minimalist dress with an Antonini Aurea white-gold diamond-set cuff and white pumps. Metallic Jimmy Choo ‘Ari’ pumps were Emmanuelle Chriqui’s footwear choice when she wore the same dress in white to the ‘Killing Jesus’ premiere last month. I know many of you didn’t like the dress to start with and will be looking for the none of the above voting responds, but I preferred Anne’s look for the colour and the styling.